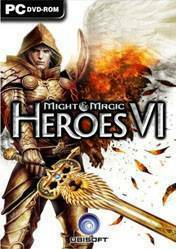 Might & Magic Heroes VI is a turn-based strategy video game for Microsoft Windows, developed by Black Hole Entertainment and published by Ubisoft. The gameplay of Heroes VI represents a step away from the five original installments. About half of initial schematics, including spells, skills, abilities, heroes, units and buildings will remain present, with the other half being innovative. For example the absence of the magic guild, mandatory building for town updates in the previous games. In Heroes VI, the magic guild leveling is replaced by the hero skill/ability wheel leveling, while new spells are learned only at particular dwellings outside the town. Finally, the game features only four collectable resources (instead of the classic seven): gold, wood, ore, and blood crystals. Multiplayer will be present. really nice looking and fun to play!